Most of the time we just talk about carry on luggage. But when you’re looking to buy, it is often a good idea to buy a package luggage set. That way, you get all of the sized luggage that you will need for any given trip. It’s an investment in the future and often you can also get a better deal. We think the best luggage set right now for the money is the Travelpro Maxlite 4 Expandable Spinner Luggage Set. This is one of the most highly reviewed luggage sets on the market and has a solid 5 star average on Amazon. And it deserves it. We have raved about the Maxlite 4 carry on’s design and build quality for years. Just take all of that goodness and apply it to a set of larger bags. The Travelpro Maxlite 4 Expandable Spinner Luggage Set is basically as good as you are going to find for the money. It is a feature rich set that includes some of the more durable parts in the industry for a fraction of what you will pay for a top of the line set. 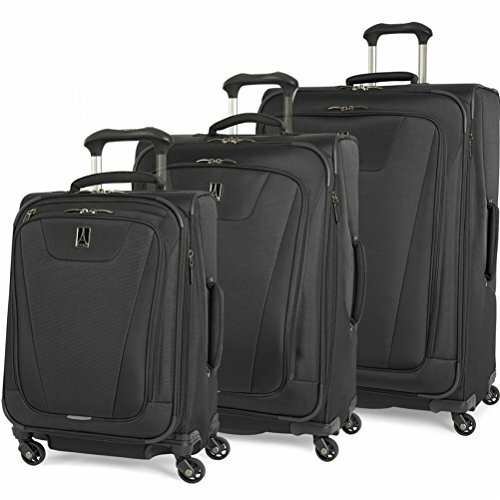 This luggage set comes with a 21″ carry on, a 25″ mid-size, and a 29″ inch large bag. Each of these are full four wheel spinners. We love the TravelPro Maxlite 4 series because it is both durable but also incredibly lightweight. Each of the bags features a water repellent polyester outer layer coupled with a super durable honeycomb tray on the underside of the bag to keep everything intact while traveling. They also have some of the best quality spinner wheels and telescoping handles on the market, especially for a luggage set that is so affordable. Each bag can expand a full two inches to fit just a bit more stuff on your way back from vacation. Quality lockable zippers and a thoughtful clamshell interior design round out this excellent luggage set. Sure, you can definitely get a better set in something from the likes of Briggs & Riley or Tumi, but these will easily be over $1,000 for the set. We’d recommend checking out the Maxlite 4 luggage set first, because for most people these bags will be the best luggage set for their needs. *If you’re interested in hardside luggage we recommend you check out our hardside luggage buyer’s guide here. Set Includes 21 spinner (14 x 9 x 21), 25 spinner (18 x 11 x 25), and 29 spinner (20 x 12 x 29). Weight 21 (5.9lbs), 25 (7.8lbs), and 29 (8.6lbs). Has airline grade aluminum telescoping handle that locks in multiple positions and unobtrusive top, side, and bottom carry handles.